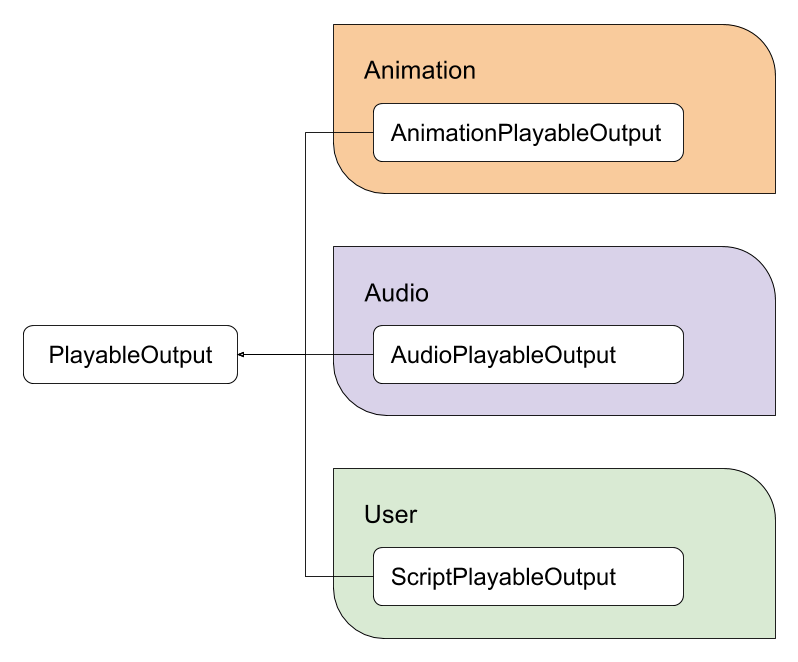 The PlayableGraph defines a set of playable outputs that are bound to a GameObject or component. 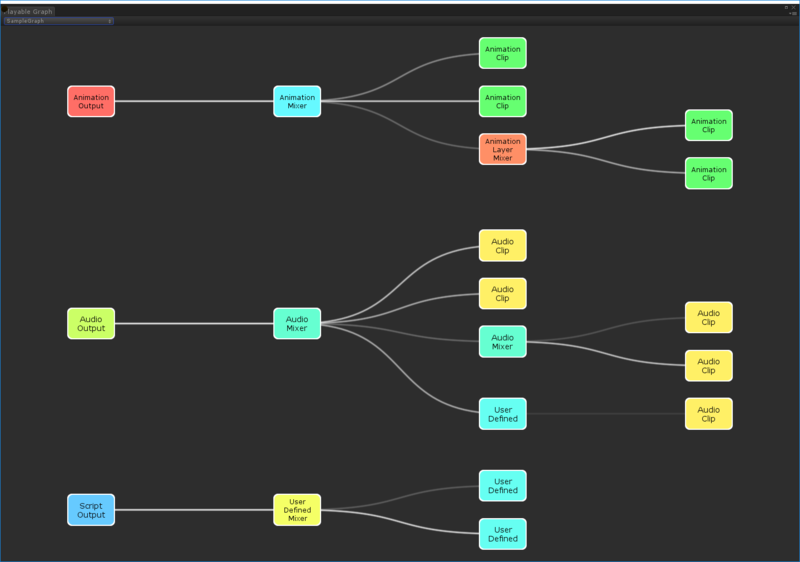 The PlayableGraph also defines a set of playables and their relationships. Figure 1 provides an example. The PlayableGraph is responsible for the life cycle of its playables and their outputs. Use the PlayableGraph to create, connect, and destroy playables. A playable is a C# struct that implements the IPlayable interface. It is used to define its relationship with other playables. Likewise, a playable output is a C# struct that implements IPlayableOutput and is used to define the output of a PlayableGraph. Figure 2 shows the most common core playable types. Figure 3 shows the core playable output types. The playable core types and playable output types are implemented as C# structs to avoid allocating memory for garbage collection. ‘Playable’ is the base type for all playables, meaning that you can always implicitly cast a playable to it. The opposite is not true, and an exception will be thrown if a ‘Playable’ is explicitly casted into an incompatible type. It also defines all the basic methods that can be executed on a playable. To access type-specific methods, you need to cast our playable to the appropriate type. The same thing is true for ‘PlayableOutput’, it is the base type for all playable outputs and it defines the basic methods. Note: Playable and PlayableOutput do not expose a lot of methods. Instead, the ‘PlayableExtensions’ and ‘PlayableOutputExtensions’ static classes provide extension methods. All non-abstract playables have a public static method Create() that creates a playable of the corresponding type. The ‘Create()’ method always takes a PlayableGraph as its first parameter, and that graph owns the newly created playable. Additional parameters may be required for some type of playables. Non-abstract playable outputs also expose a Create() method. A valid playable output should be linked to a playable. If a playable output is not linked to a playable, the playable output does nothing. To link a playable output to a playable, use the PlayableOutput.SetSourcePlayable() method. The linked playable acts as the root of the playable tree, for that specific playable output. To connect two playables together, use the PlayableGraph.Connect() method. Note that some playables cannot have inputs. Use the PlayableGraph.Create() static method to create a PlayableGraph. Play a PlayableGraph with the PlayableGraph.Play() method. Stop a playing PlayableGraph with thePlayableGraph.Stop() method. Evaluate the state of a PlayableGraph, at a specific time, with the PlayableGraph.Evaluate() method. Destroy a PlayableGraph manually with the PlayableGraph.Destroy() method. 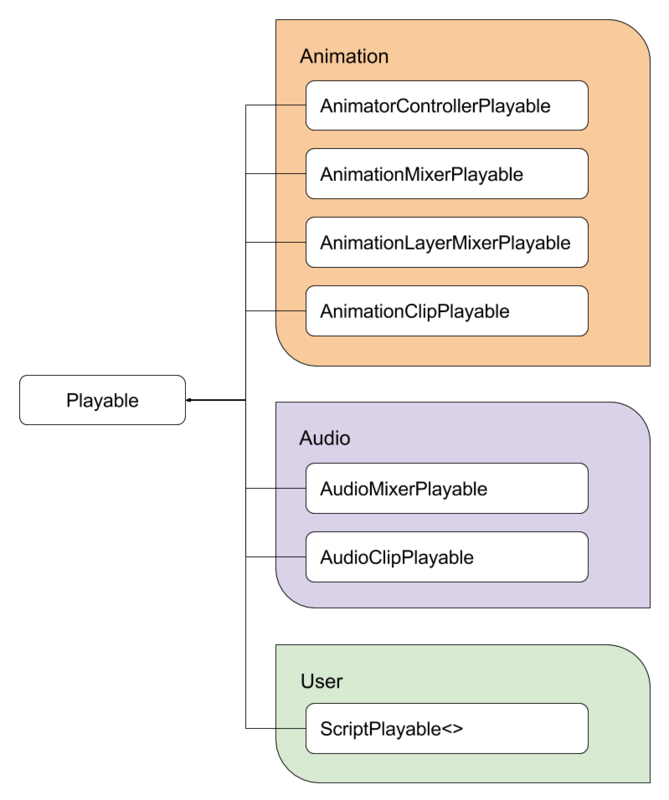 This method automatically destroys all playables and playable outputs that were created by the PlayableGraph. You must manually call this destroy method to destroy a PlayableGraph, otherwise Unity issues an error message.